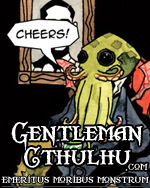 I wouldn’t say that Wednesday blog postings are the new trend (as Tuesday had always been the day ever since Gentleman Cthulhu took Wednesday; and while I’m on that, there’s a new comic up today: gentlemancthulhu.com), but with everything I’m juggling at the moment, I have to admit that the blog is a slightly lower priority at present. Still, I wanted to take a moment to mention (again) the number of things coming up to keep your eye out for (or get involved in). First, again, commissions are officially open (prices and inquiries on jmdesantis.com/commission-requests/) and will be through 31 January 2018. The plan is to book about two to three per week (depending on level of detail and requests), and I already have five bookings since before November 1st (when opened them). Most important to mention is that after January, I am going to raise my prices, mostly both because I haven’t in such a long time and because I do want to start taking more time with my commission work. So if you’d like a commission done, take a look at my current prices and offerings and we can discuss when I can get yours done. Also by the end of this month, anyone who would like to receive a copy of both my Inktober collection and my new sketchbook should head over to my Patreon page (patreon.com/jmdesantis). All patrons, this month, will have their name included in both books (for $3.00 or more). At the $5.00 level, you’ll have access to a digital copy, and at $15.00 or more, you’ll receive physical, signed copies of both. You only need to be a patron in November to get these rewards. If not, you’ll likely have to wait until sometime in 2018 to grab a copy at a convention or (possibly) online. Last of all, as mentioned last week, I’ve been secretly building a new storefront to allow purchases of items directly through my website. This is not to replace my Zazzle and Society6 stores, or compete with my regularly published material found through other online distributors. Rather, I’m offering specialty items, items not available elsewhere, and original artworks through the new store, including the entire collection of my recent Inktober pieces (sold individually). My Patreon supporters had first access two weeks ago, and already a few items have gone. Mailing list subscribers received an e-mail today giving them early access. Next week, I’ll open the new store up to everyone else just in time for Black Friday and the following Cyber Monday. So, if the two sketchbooks didn’t convince you to become a patron, and you were interested in one of my original Inktober pieces, it might be worth even getting in at the $1.00 support level, just to get access to the new store. Whichever way you choose to support, commission, Patreon, an online purchase or just to share some links, it’s much appreciated. And keep checking back. I may have gotten a little behind on a few things, but I’m catching up and I’ve got a lot more planned for the end of this year, 2018, and beyond.